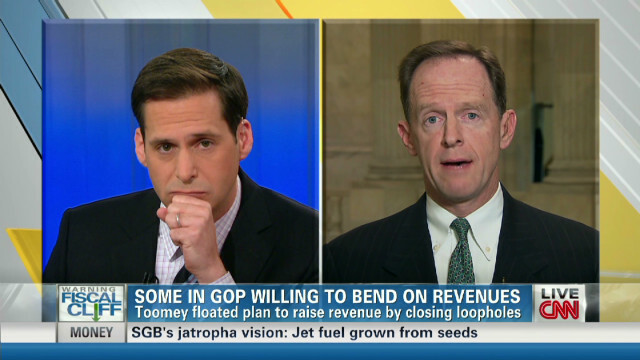 Senator Pat Toomey (R-PA) addresses the fiscal cliff negotiations and says he’s open to closing loopholes and reducing deductions, if we lower marginal rates and decrease spending. However, he says he would not violate Grover Norquist’s Taxpayer Protection Pledge by doing so. When CNN’s John Berman points out that closing loopholes and reducing deductions would violate Norquist’s Taxpayer Protection Pledge, Toomey answers, “I don’t intend to violate any pledge. My pledge is not to support higher taxes. What we’re faced with in just a few weeks is a massive tax increase. If I can help ensure that we don’t have that tax increase, then I believe I’ve fulfilled my pledge to fight for the lowest possible taxes.” Berman adds that Norquist may disagree with him.